The media giant's unique intellectual property and sports rights provide a path to success. But Netflix and Amazon's scale advantages are nothing to gloss over. Following the disclosures made during Tuesday's earnings call, there's more clarity than ever regarding how Disney (DIS - Get Report) plans to contend with a digital video market in which Netflix (NFLX - Get Report) and Amazon.com (AMZN - Get Report) loom large and cord-cutting continues pressuring its lucrative pay-TV affiliate fee business. The disclosures suggest Disney is being pretty thoughtful about how it plans to support, price and segment its various streaming offerings. They also suggest that, thoughtful or not, Disney's decision-making is constrained by the big head-starts Netflix and Amazon possess, as well as by its need to avoid cannibalizing giant sports affiliate fee revenue streams. On the call, CEO Bob Iger disclosed an upcoming ESPN streaming service will launch this spring, be known as ESPN Plus and cost $4.99 per month. He reiterated the service will stream MLB, NHL, MLS and college games (among other things), albeit no NFL or NBA games, and added that it will also provide access to the ESPN Films library. ESPN Plus, along with the WatchESPN service provided to pay-TV subs, will be accessible through a "completely re-conceived and redesigned ESPN app." Iger also said Disney plans to "invest further in [ESPN Plus], adding more live games and [producing] sports programming, along with even greater personalization in the years ahead." Regarding the upcoming Disney-branded streaming service (first disclosed last August), Iger reiterated the service will launch in late 2019, and will -- once a deal with Netflix runs out at decade's end -- be the exclusive streaming home of Disney, Pixar, Marvel and Star Wars films. He also stated the service, already promised to initially be cheaper than Netflix, will contain "a few" different Star Wars original series, along with a High School Musical series and other originals relying on Disney's IP. Notably, Iger also indicated that Disney doesn't plan to have its streaming service match Netflix's content spending, arguing that the company's brands and IP make doing so unnecessary. "[W]hen you go to market with Star Wars movies, Disney movies, Pixar movies, Marvel branded and branded television shows under those umbrellas...that will give us the ability to probably spend less than if we had gone to market with a direct-to-consumer service without these brands." That's the glass-half-full view of Disney's strategy. The glass-half-empty view: Netflix's giant head-start makes it impossible for Disney to justify matching Netflix's original content spend, and perhaps also not Amazon's. Netflix ended 2017 with 117.6 million streaming subs, and is forecast on average by analysts to end 2019 with 165.6 million. Such torrid subscriber growth has made the company comfortable setting a 2018 content budget of $7.5 billion to $8 billion (up from 2017's $6 billion), and to promise further spending hikes for 2019 and 2020. Amazon doesn't break out how much its spends on content for its Prime Video services, which come bundled with Amazon Prime subscriptions. But JPMorgan estimated last year Amazon would spend $4.9 billion on content in 2017. And with Prime's global subscriber base believed to be above 70 million and still growing rapidly, Jeff Bezos' company has plenty of incentives to keep investing heavily in Prime Video. In addition to enabling giant content budgets, Netflix and Amazon's scale provides them with a ton of viewing data they can use to personalize their services and inform future content-financing decisions. It also gives them more flexibility to finance original shows and movies aimed at international markets or niche audiences. The "tentpole" films puts out by Disney's studios will certainly serve to keep content costs down for the upcoming Disney service. But the fact that Disney has no plans to get rid of the traditional theater release window for its films will affect the popularity of its service a bit. Netflix, by contrast, is comfortable making its original films immediately available on its service. Disney's wish to protect Hulu's existing business, as well as the "family-friendly" nature of the Disney brand, also acts as a constraint for the upcoming Disney service. Though the company plans for the service to feature Marvel and National Geographic content it will obtain through its acquisition of much of 21st Century Fox's (FOXA business, it plans to continue relying on Hulu to distribute Fox and FX studio content. With 17 million paid subs as of January, Hulu also has much less scale than Netflix or Amazon. The service has carved out a streaming niche by offering an unmatched library of licensed TV shows and developing a handful of popular originals, but its relatively small subscriber base will remain a handicap. 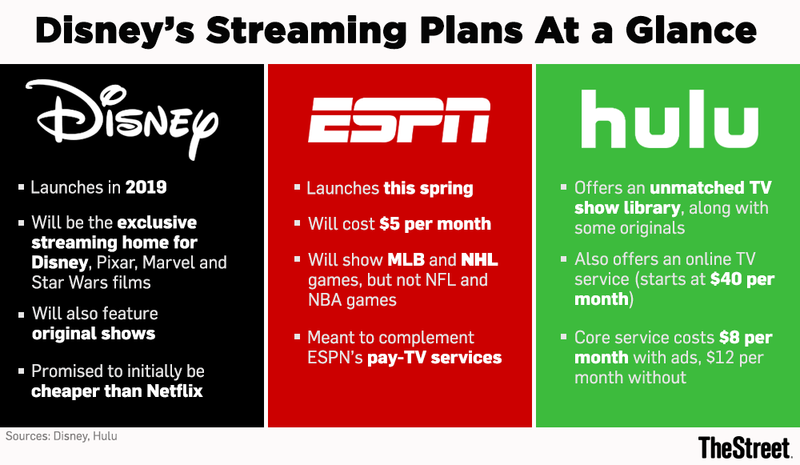 And by splitting its non-sports streaming offerings between two services, Disney could have a harder time winning over consumers already signed up for some combination of Netflix, Amazon and HBO's services -- particularly ones that don't have kids. Moreover, with Disney set to have a majority stake in Hulu following the Fox deal's closing, there's some risk that minority investors NBCUniversal and Time Warner (TWX could become less enthusiastic about providing popular content for the service. As for ESPN Plus, it's quite clear that Disney, which is believed to have seen ESPN's pay-TV subscriber base fall by 13 million over the last 6 years to 87 million, doesn't want to do anything to cannibalize pay-TV revenue streams. And those revenue streams remain massive: ESPN's family of channels are believed to cost over $9 per subscriber month alone, per SNL Kagan. In addition to not showing any NFL or NBA games, Disney has signaled it doesn't plan to heavily use the regional sports content it will be getting through the Fox deal to strengthen ESPN Plus. Also, it remains to be seen just how many MLB, NHL and college games likely to appeal to a national audience will be shown on the service. Nonetheless, ESPN Plus' aggressive pricing and support for a number of different pro and college leagues could let it appeal to some sports junkies. Just as Hulu appeals to TV junkies, and the upcoming Disney service, backed by an unmatched treasure trove of IP, should appeal to many households with kids as well as big fans of Disney's superhero franchises. All of that provides Disney with a foundation for creating a sizable direct-to-consumer streaming business. It just doesn't give the company a Netflix-killer, or a way to fully offset the continued loss of ESPN pay-TV subs to cord-cutting with a sports streaming service. Avoid Disney's stock? TheStreet's Executive Editor Brian Sozzi reveals why you should.